48 hours of experimentation, collaboration and learning while having fun at the same time. There’s nothing like it – the Global Service Jam. We bring you the Leeds Service Jam, learning by doing! It’s open to the whole community of Leeds, designing services better, working together and trying out different service design approaches. A great way to meet new collaborators and try new techniques. The event is about learning and making new connections by working together. * Everyone gathers on Friday evening to discover a global theme, which is kept secret until jams all over the world have seen it. * We split into teams and work together through Saturday and Sunday to design and prototype new services inspired by the theme. * At 3pm on Sunday everyone shows what they’ve made and shares their work online with a Creative Commons License. We provide the venue, materials, service design resources for inspiration. All we need is you, and some magical collaboration. What will you design in 48 hours? Up to 30 jammers will take part. We hope you’ll be one of them! 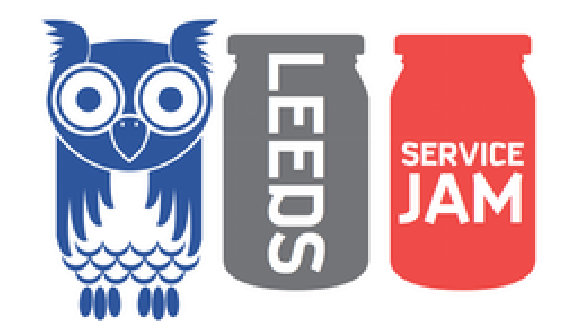 The Leeds Service Jam is run by volunteers, many of whom also organise Leeds GovJam and Global Sustainability Jam events. Your ticket price includes materials, lots of service design tools and tips. Could you join our volunteer team? No previous experience necessary. If you can give up some time before and during the jam to help make it happen, contact Kathryn (contact@kathryngrace.co.uk) for a chat. Could you sponsor the jam? Nobody makes a profit from the Leeds Service Jam. Your financial support will help us keep ticket costs down, and open up new possibilities.